Recap of Day 25: Who wants to talk poop? I figured you can't cleanse and not talk about it. Everyone thought the "she-shes" comment was funny, but I wasn't so sure I wanted to share anything beyond that. Why should I care? Everyone does it (some less and some more). So the truth is...I go at least 5-10 times a day (precleanse it was one glorious time in the morning) and let's just say it's has not been solid since day one, but no discomfort thankfully. Okay I officially just went there...I am slightly dying inside but I promised myself to blog the truth. I haven't been freaked out in the least. If my body has been in attack mode for 22 years, 25 days of "puff the magic dragon" poop isn't gonna scare me. I kinda see it as my body truly detoxing and getting rid of everything. But you better move out of my way when I need to go. More importantly, I graduated to a solid yesterday (sounds like I am talking about baby food, boy I wish I was). Congrats, you just entered my very private world of cleansing. Hmmm...yep still mortified, but happy to share. Day 26: Well, maybe with some less bathroom time I might just finish up my goals for the week. This cleanse has inspired me beyond my original intentions. I have some exciting things I have been brainstorming about since I started and I can't wait to share them with you (definitely more exciting than my bowel movements). Fact: Our bowel movements are one of our greatest indicators of what is going on in the body. I remember years ago the first time I heard Dr. Oz mention how important the shape of your poop was. This 5 minute Dr. Oz video is a gamer changer in the poop department. It changed my life years ago. 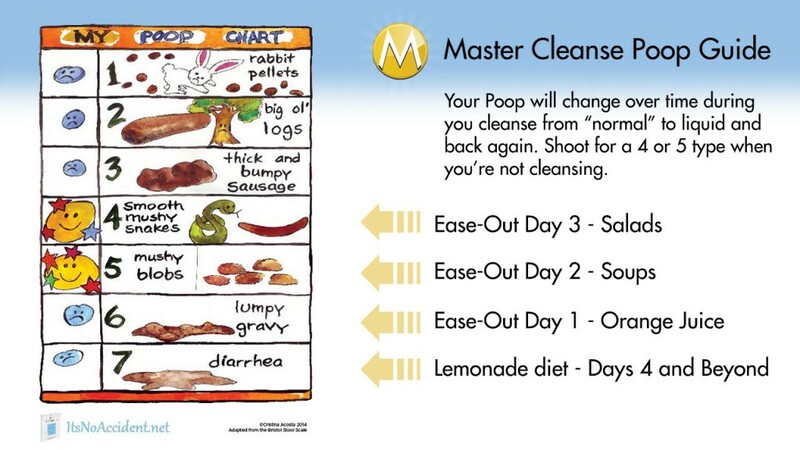 The Master Cleanse blog post diagram is quite funny - yet informative.